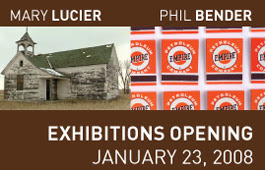 Once again THE LABORATORY OF ART AND IDEAS (http://www.belmarlab.org/) will showcase another progressive fine art show, this time featuring Denver talent Phil Bender with LAST PLACE and Mary Lucier of NYC with her exhibit PLAINS OF SWEET REGRET. Phil Bender's large collections of discarded everyday objects reflects a symbol of a lost Western society paired with a sense of nostalgia. It brings the viewer to a place of familiarity and awe of the common art installation. Mary Lucier's video installations of the North Dakota plains invites viewers to see the beauty of the landscape while witnessing the loss of its serenity through typical modern day influences.